– Offer great protection in salty sea-air environments (as found on Ships and Ocean Vessels). – SMALLER UNITS UP TO SIZE 30” USUALLY IN STOCK. 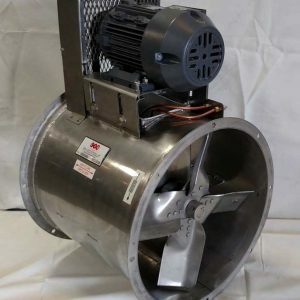 Hot Dipped Galvanized Steel Duct Fans are used in wet environments usually associated with Salt Water and Marine applications. Used on Ships and Ocean Going Vessels. harsh, wet environments when equipped with mill and chemical duty motors. Epoxy Coated or Stainless Steel Washdown Motors also available. Fan housing is all welded, heavy gauge hot dipped galvanized steel construction. Motors are high quality industrial grade available in single or three phase – totally enclosed, explosion proof, or washdown duty. Mill and Chemical Duty or Stainless Steel Motors also available. – Recommended for use in dry environments with temperatures less than 180 Deg. F.